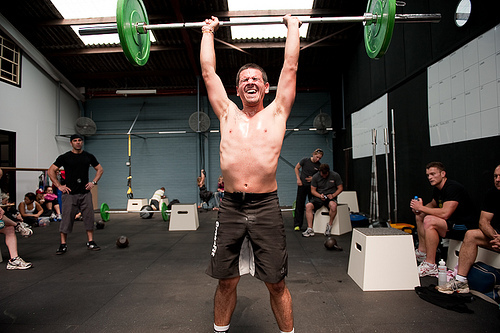 How do regular people look when they do CrossFit? It started because like most great things, a friend told me about it. Since then I climbed a 20-foot rope for the first time in my life. Did handstands across America and Canada. Learned I have amazing mobility and one amazing overhead squat. Met some of my closest friends and tightest community through my gym. Recruited at least a dozen people into CrossFit through real-life conversations and conversations on Twitter (seriously). Injured my right shoulder. Got depressed, angry, and really frustrated about it. Finally figured out a treatment plan that worked. My friend, Dillan Monson, shot a video that night at the gym during the WOD, and yours truly made her first CrossFit video appearance, banded pull-ups, cleans, and jerks included. As another CrossFit friend put it, this is how ‘regular’ people look when they do CrossFit. By that, she means people like you and specifically me, not the elite-elite athletes. Locals Gym – 2/2/12 from Dillan Monson on Vimeo. There are two kinds of end of the year/New Year blog posts to write. The first is a reflection of the previous year – everything you did, everything you didn’t, what you’re proud of, and what you’re not. And the second is a laundry list of “do’s” and “don’ts” for how to make the next year rock much harder than the last. And then there’s a third, which doesn’t reveal anything about the writer but gives you, the reader, a map of how you can stick to your resolutions for the first time ever. New Year’s Resolutions are like plans – you write them for how you’re feeling (usually fat) at that time (post-holidays) for the future (that has yet to be written) – and they never work out. They look great on paper, but horrible in execution because they all lack one thing – foresight and the understanding that you have to sacrifice something to accomplish what you need (and the ability to adjust to continue the momentum). Instead of resolutions or plans, I make goals. I did this unknowingly as I entered 2010 and consciously as I entered 2011. I met the three goals I set in 2010 but not all of the goals I set for myself in 2011. While all of this past year’s goals looked great in December 2010, by mid-2011, an imbalance between work and life happened and parts of those goals were prioritized while others were not. Plus I set too many goals. I don’t feel like 2011 was a failure, but just plain weird. In the Christmas letter John and I sent to our family, I summarized the year as one of “change,” and by God, if that isn’t true. 2011 started with a lot of oomph, passion, and excitement as things were set in place that I had been working hard towards achieving in the previous year and a half. But I got burnt out early, outgrew that opportunity faster than I imagined, and a new opportunity revealed itself and I jumped on it. If 2011 was a shape it would look like a giant “U” with a big, deep dip in the middle. Earlier this week, my husband and I spent the evening working through Benny Hsu of Get Busy Living’s 2011 Year in Review Worksheet. What I like about his template is it focuses on how the previous year ended so you can reflect on what you’re proud of, what you accomplished, what you learned, what didn’t work, and where you’d like to see yourself in the future. 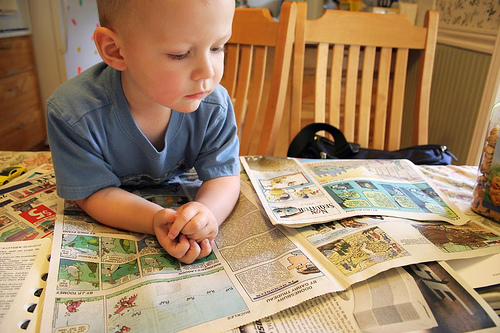 Benny’s worksheet helps you see where you want to go by reviewing where you came. It’s similar to racing a car – they say that you should look at where you want the car to go, not at the wall that you don’t want to run into. Truth: It takes a village to raise a child. It takes a community to create a leader. And it takes an individual to take on that responsibility. Fact: No matter how much help a person is offered, it is useless unless they are the one to take action. You can sit down with a fortune-teller who will read your energy, interpret your past, show you elements of your present, and offer you a path towards your future. But once you walk out those doors, set one foot in front of the other, everything could change.